It's such a fabulous thing to live so close to the beach. It's two miles from our driveway to the sand. We take advantage of this and go as often as we can. Most of the time we go close to dusk with a blanket and jackets and pick up the Albertson's $5 chicken dinner and dine on the sand while we watch the sun set over the Pacific. I've always lived near water, whether the Pacific Ocean, Lake San Antonio, the South China Sea, the San Francisco Bay, Elizabeth Lake, or Tokyo Bay. I equate the water with peacefulness, particularly the repetitive waves that crash on the shore. 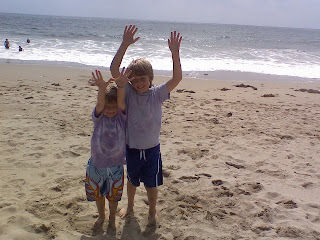 The ocean air draws out the excess energy that my children are overflowing with, leaving them calm and restful. 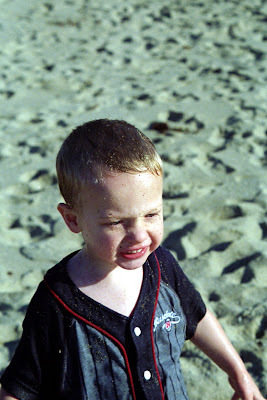 Nathan screams at the waves, as loud as he can. 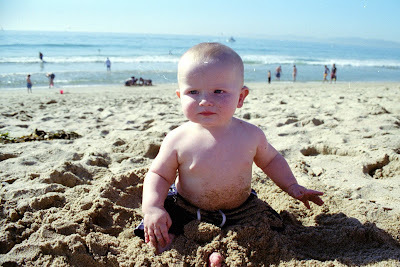 Sometimes I think the roar of the ocean is the only thing consistently as loud as my son! I took them to the beach this week and watched as they grew more bold by the minute, creeping in until the waves were crashing over their shoulders. Another little boy taught Nathan how to body surf, and now he's begging for a boogie board! Both Michael and I surfed in our youth (Mike in high school, me in middle school) so we'd totally be up for enrolling the kids in surf camp... in a year or two. Hey, it's an expensive sport! In the meantime, I found a couple of kid-sized boogie boards at the grocery store (of all places!) marked down to a ridiculously low price, and I snatched them up. An old friend of mine and her kids are coming for a visit next week and we plan to go to the beach and put the boogie boards to good use! Ah Summer, how I love you!